en'vy (en'vé) n. There are only few handpicked devices that have caused sensation even before their official launch in the Notebook World. 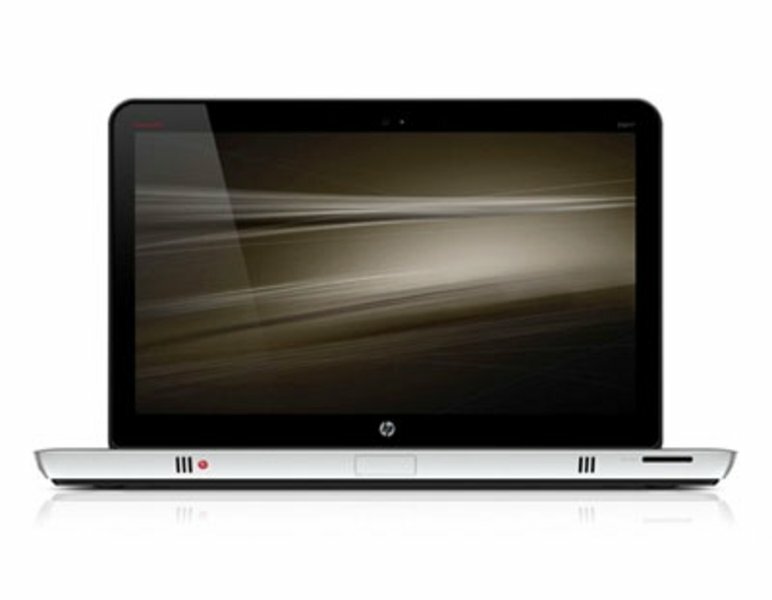 The Envy Series from HP belongs to these, as they see themselves as the top class in the assortment, on par with Apple MacBook Pro laptops. It's already been over a year since HP has provided for commotion with two new notebooks called Envy. The notebook major league is supposed to be really stirred up with the Envy 13 and Envy 15, and that in one of the most demanding categories - multimedia notebooks. The task here is to unite performance and mobility and also all other factors that could be of interest for the user. The result unfortunately didn't turn out quite as glorious. In the beginning there were problems with acquisition, and then the devices had their own eccentricities, for example high noise emissions and temperatures, as we reported in a detailed review. 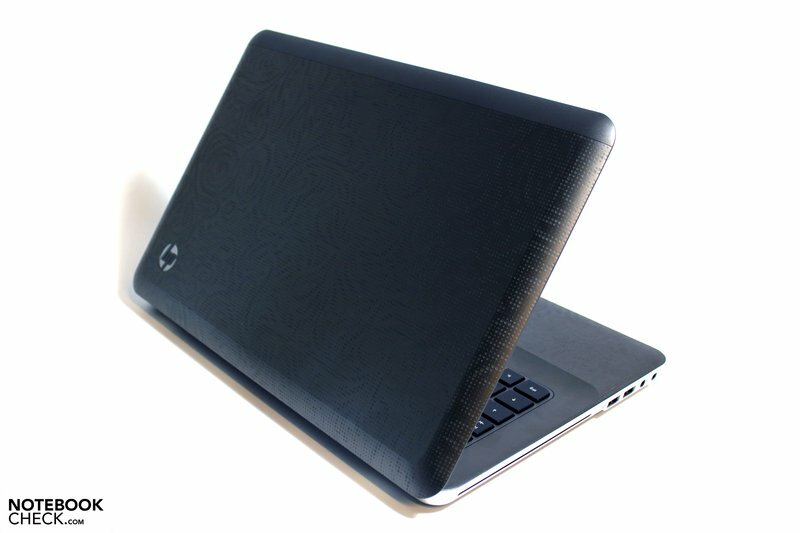 And now, not even a year after its sales start, both existing Envy notebooks are being replaced - although sales were first rate - at least according to information from HP. Now a remake of both devices with the latest hardware in the already known design follows. Also, a few interesting features of both predecessors can be rediscovered. Despite the generally observed 13 inch trend, the choice of size for the new Envy is baffling: The acutely endangered 14 inch format and a 17 inch notebook remote from any kind of mobility are delegated to restore the (lost?) 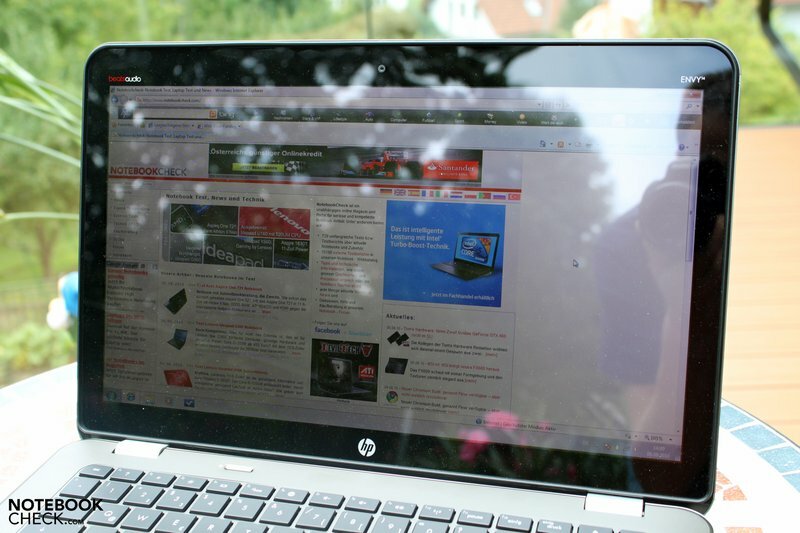 honor of the "Best Lifestyle & Consumer Experience" laptops. There haven't really been many changes in the new Envy 14's basic principle. 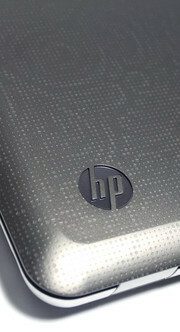 HP relies on high-end metal components, which are also used for the surfaces here. Thus, the user comes to enjoy excellent haptics that virtually all known laptops with a plastic case simply can't keep up with. Whilst the bottom and side edges around the base unit feel velvety soft, and the matt surface doesn't present a fertile base for fingerprints, the wrist-rest and the display lid with the familiar diamond-shape texture want to please. Above that, the size and arrangement of the single indentations provide a floral design. This isn't only pleasing for the eye, but hands also feel very comfortable on these surfaces. Nevertheless, a significant factor of the metal case (aluminum/magnesium) is its excellent stability. There is neither a noteworthy denting possible on the base unit, no matter if on the bottom or upper side, nor in the vicinity of the optical drive, or on the display lid. This also applies to potential twisting while picking up the notebook with one hand or creaking noises - there's not a chance of that in the Envy 14. Even the display lid supplies at least a satisfactory result in this regard. 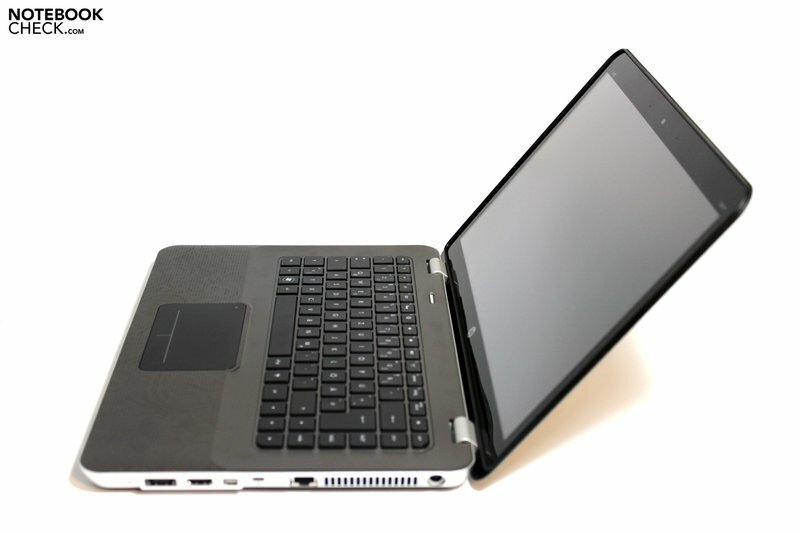 As to both display hinges that are visibly covered by a silver gray metal part, they can't completely prevent the notebook's display from teetering during mobile use. The Envy 14's closed state has been solved cleanly, though. A thin rubber lip around the edge-to-edge display cleaves to the base unit and barely lets a grain of dust in the area between the display and keyboard. The vain Envy naturally doesn't have a securing latch, but the hinges' closing tension is sufficient to keep the display adequately tight in a closed state. We can determine a maximum angle of merely 127° between display and base unit in an opened state. This is considerably less than many other notebooks and could lead to restrictions in certain situations. The cover for the inserted battery on the base unit's bottom is a detail worth mentioning. The easy to use slider releases the lock and you can remove the aluminum lid that covers about a third of the bottom. 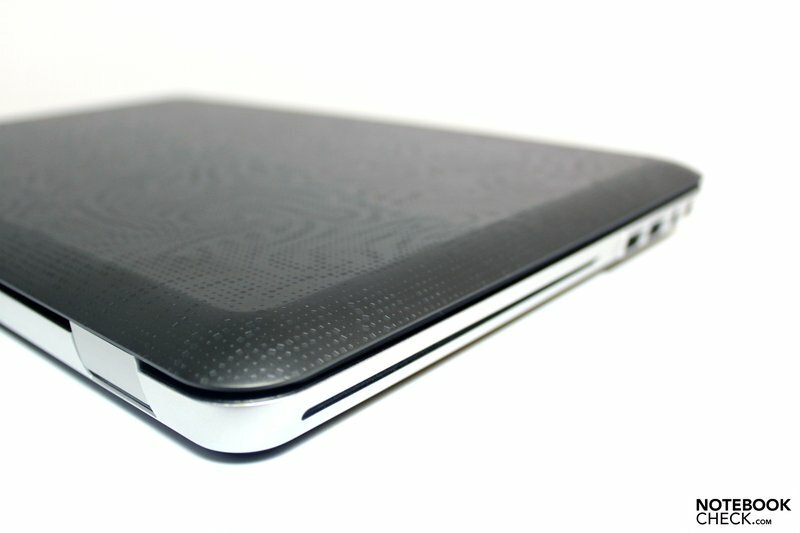 It conceals both the battery and the 2.5" hard disk. The locking mechanism that receives the lid again perfectly and without any fiddling, and holds it securely is impressive. Comparable precision with accordingly thin plastic components is practically impossible. 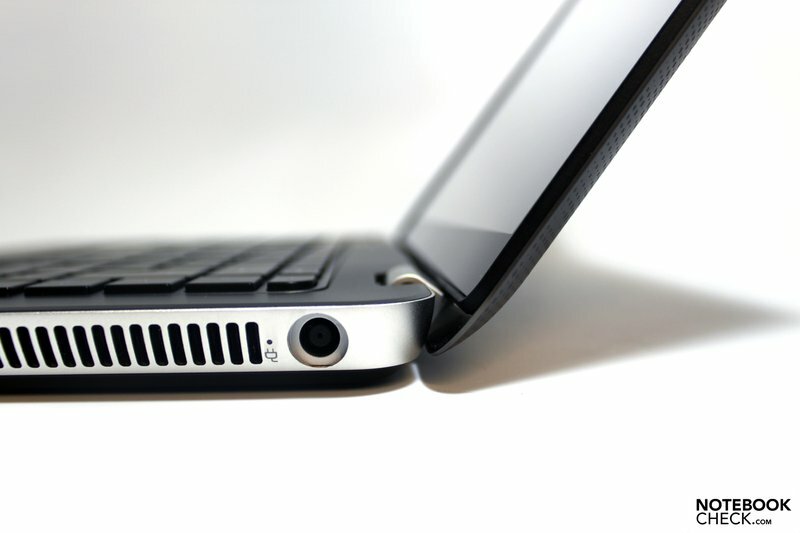 Nevertheless, when the notebook is placed on a surface with its front edge, the cover can emit a slight clattery noise. 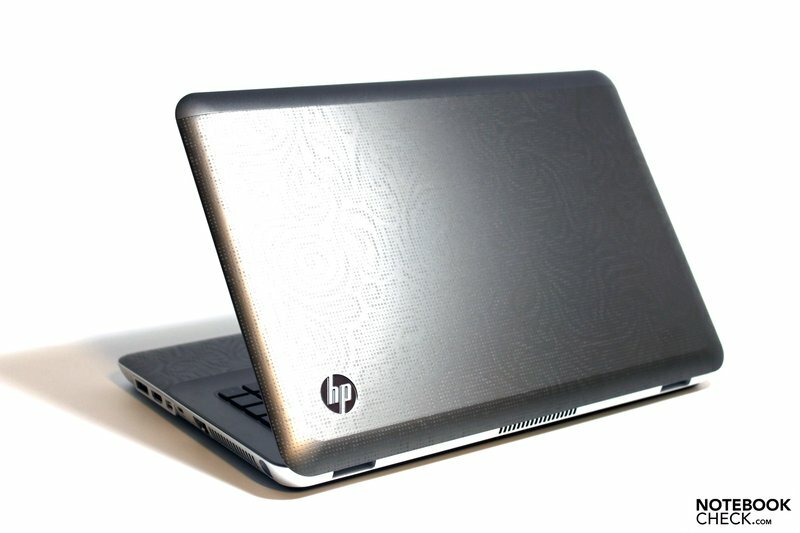 HP still remains far from a unibody case despite its high standard. And anyway, you can find feasible, because also functional, design gimmicks from the responsible designer here and there on the notebook. For example the minute LEDs in the on/off button area or also by the touchpad, the control key for wireless modules or the audio output, which supplies discreet and clear information about the status of single functions. As to the connectivity, every type of notebook has a certain obligation. We naturally expect a bit more from a high-end device, seeing that the customer ultimately wants to get something for his money. 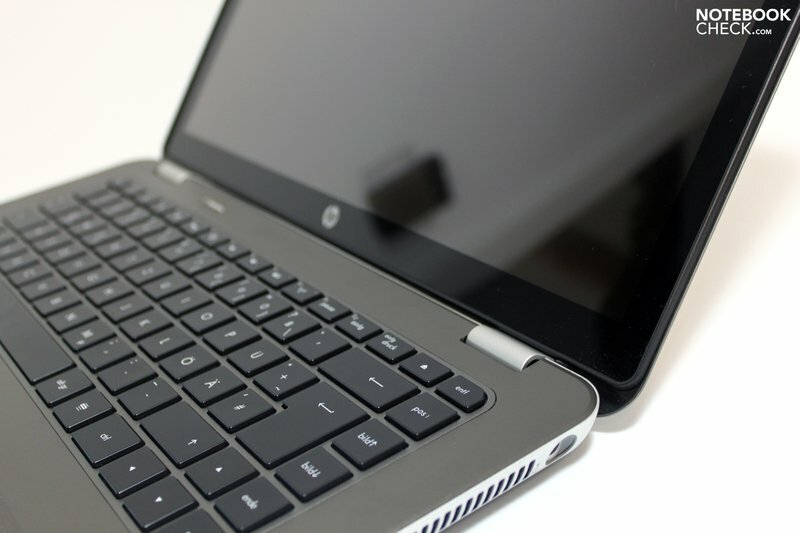 HP places two USB 2.0 ports and two 3.5mm jacks on the case's left. One of the latter is for connecting a standard headphone, whilst the other socket is implemented as a combined headphone/microphone port. 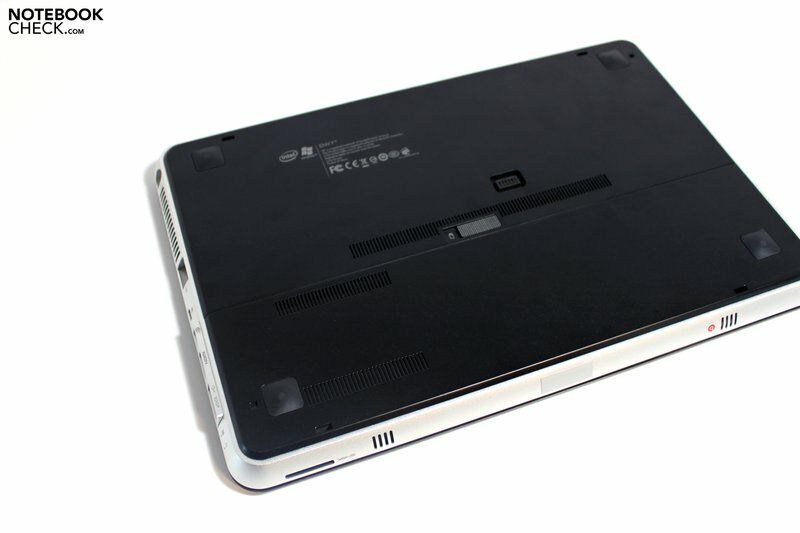 The optical drive follows in the back half, made as a slot-in solution. 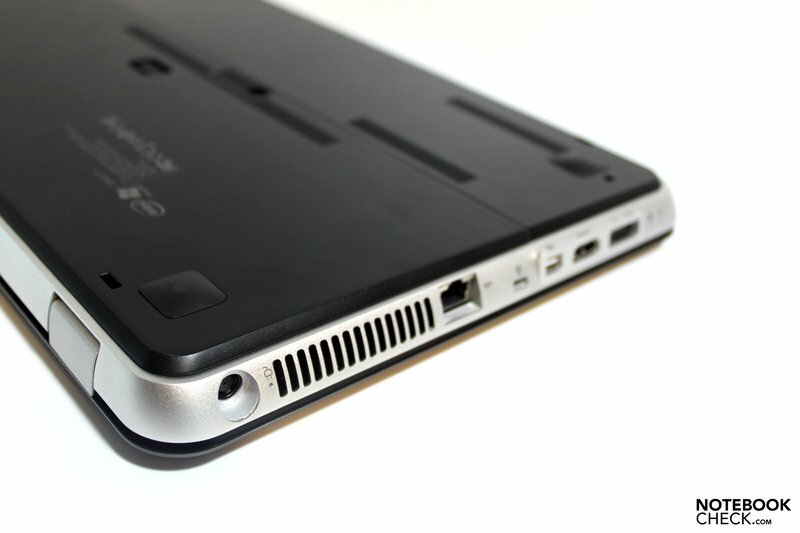 The rear is exempt of any ports due to the display's closing mechanism. Just like the front that only accommodates a cardreader (2-in-1 for SD and MMC cards. Talking about cardreaders: The otherwise rather sparsely equipped (but very stylish) carton also harbors a 2GB SD card from Scandisk. In Envy style - what else. On it: the notebook's manual in digital form. Then it again gets interesting on the right edge that holds other interfaces. We find, from front to back, a USB/eSATA combo interface, a HDMI port, a mini display port, Kensington Lock, RJ-45 LAN and in the back corner, the power socket for the adapter. If you look closer at the base unit's bottom, you'll find a socket in the center area. 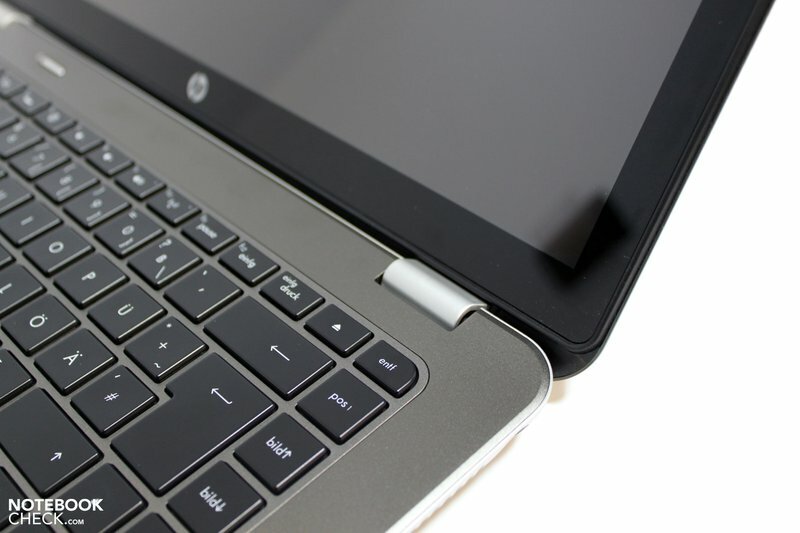 However, this isn't a docking port, but rather a connector for an external slice battery solution from HP. More about that in the Battery Life part. 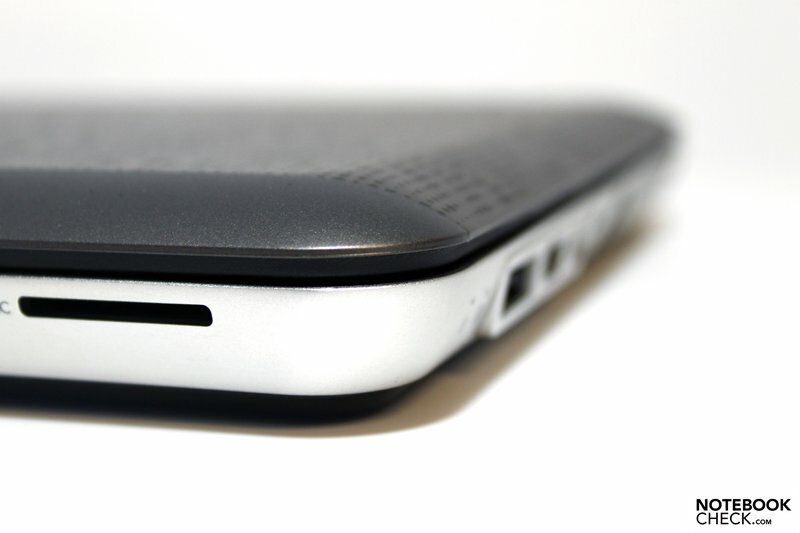 As for the interface distribution, you could complain about the placement of all ports on the front lateral edges. It can turn into a more or less large problem depending on the kind and amount of connected devices. For example, connecting an external monitor via HDMI is definitely disturbing especially for righties, because the cable obstructs the right area beside the notebook. 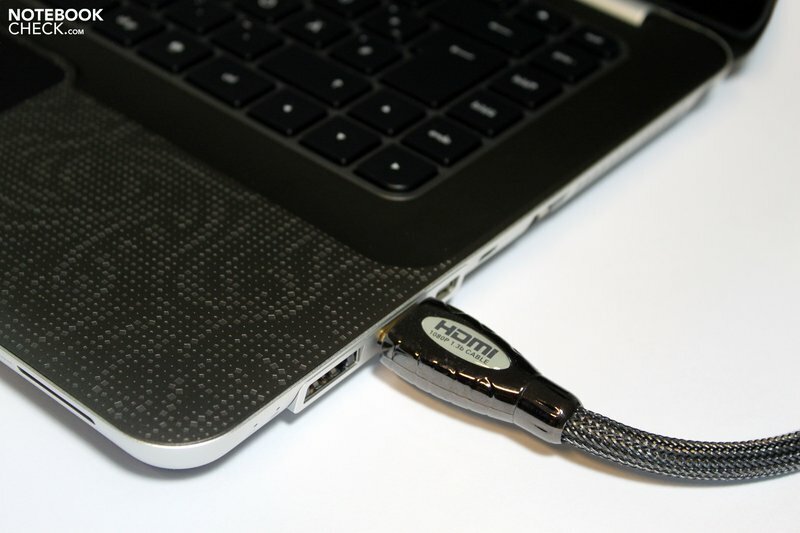 In view of the circumference, USB 3.0 could also be listed as a possible deficiency. Nevertheless, you still have the option of fast data transfer to external memory media with eSATA. The lack of an ExpressCard slot could be bitter for the one or other potential buyer. Of course, a great entertainer needs the standard equipment to fulfill its duty. The available gigabit Ethernet, wireless LAN standard 902.11 a/b/g/n and Bluetooth are a part of it. Fans of wireless broadband internet, that is UMTS/HSPA, will be disappointed because of the missing option in this regard. They can only resort to an unattractive USB modem that then also has to be plugged in very obviously on the left or right front. Even if this is a high quality companion, you do notice the distance to HP Elitebooks conceived for professional use, in view of data security. 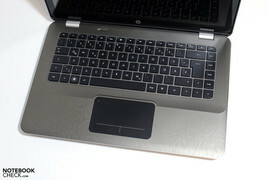 The user only has the slot for the Kensington Lock for securing the notebook, apart from the system's password inquiries. Like systems of other manufacturers, HP's Quick Web allegedly grants a faster access to important data (addresses, appointments, internet, etc.) than it would be possible if the entire notebook has to be booted. The benefit of this feature is controversial and primarily dependent on the user's individual habits. HP's Quick Web starts in a shut down system after pressing the on/off key and is available within fractions of a second. It's a lot faster in comparison to booting Windows 7, but the convenience of HP Quick Web's economized desktop isn't particularly inviting for a longer use. That what wants to be fashionable needs a chiclet keyboard. 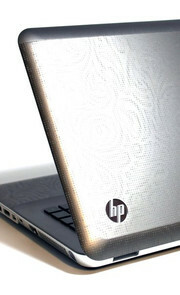 Neither Apple's chief designers nor the responsible gents at HP make an exception here. Just because it looks good doesn't necessarily mean it can be used well - but the one doesn't exclude the other either. In the Envy 14's case, we face a very generous layout with absolutely even keys. The keyboard even surpasses those of various business evergreens with its width of 30 centimeters. The standard keys have a size of 15x15 millimeters and can also be triggered accurately due to the large key gaps of about 3 millimeters. The single keys' arrangement doesn't have any surprises. Important keys for typing texts, like shift, space and enter, have been sufficiently sized. The typing feel is characterized by a comparatively short stroke length with a spongy stroke, but nevertheless clear pressure point. Primarily, seasoned frequent typists will take delight in that, especially if they are able to touch type. The short, direct stroke has a positive effect on the input speed after a bit of accommodation. The fact that the F keys' primary functions have been replaced by various control keys was able to convince us completely. Adjusting the display brightness, the volume level or enabling the wireless modules is easy and fast due to that. This way, it's easy to live without the hot keys that don't really fit in the overall concept anyway. Once again, with kind regards from Apple. 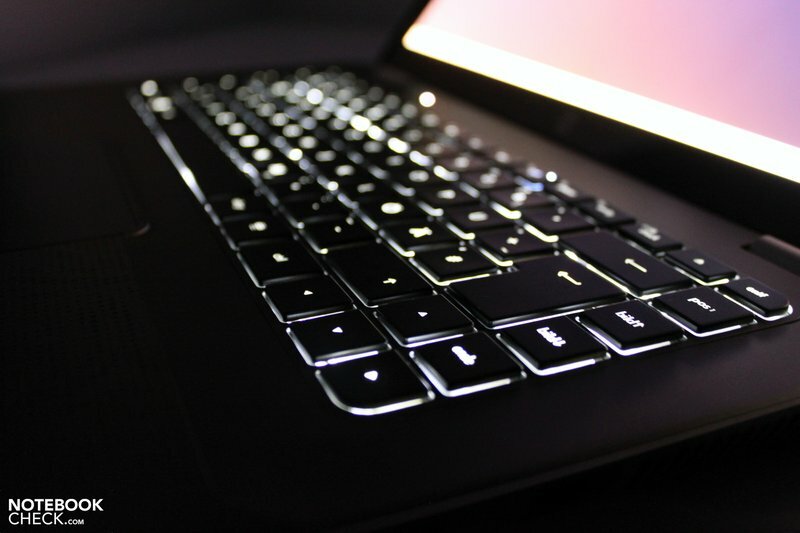 Mandatory for notebooks with claim on design: LED backlit keyboard. There aren't any standard components used for the mobile mouse replacement. 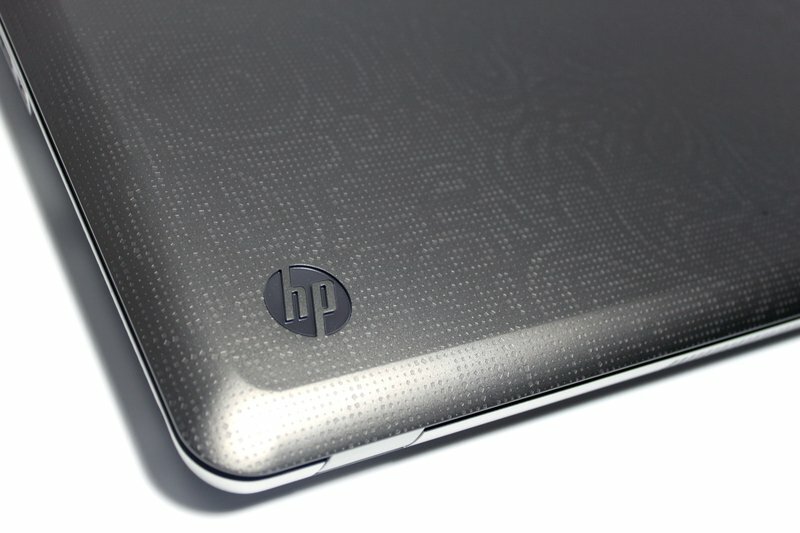 HP builds in a comparatively large touchpad with a diagonal of 12 centimeters. 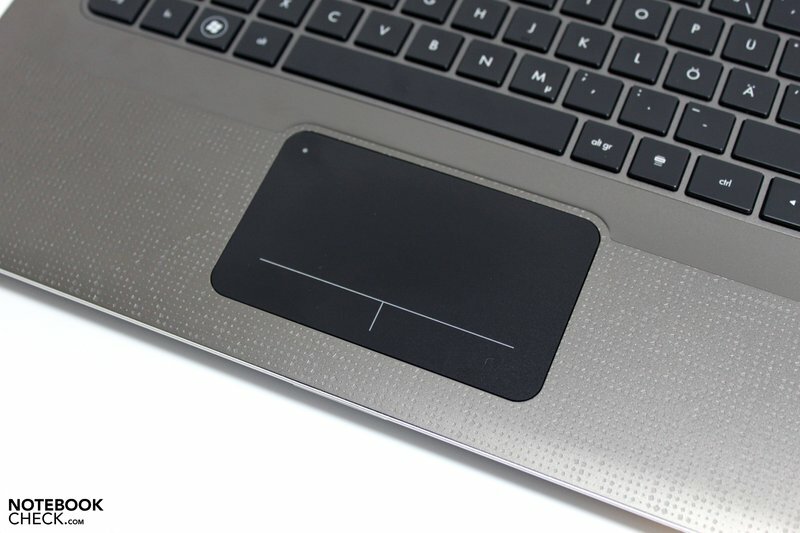 Apart from its size, the pad distinguishes itself especially with its full sensitive surface, including both touchpad keys, from common solutions. The second striking trait is the pad's click function. 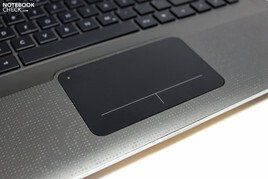 The entire touchpad is made as a rocker and can be pressed on the visibly marked lower area. If you really do that in the intended zones, it emits a pleasant and clear feedback. It gets more problematic the further the finger glides upwards. A palpable delimitation of the key field doesn't exist. 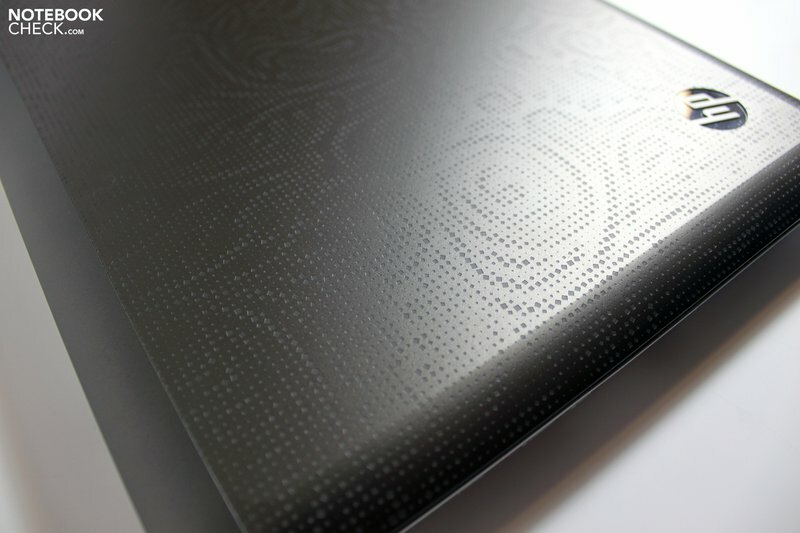 The pad's pleasant surface and its responsiveness made a very good impression in practical use. However, we weren't satisfied with the click solution. When we, for example, reached with our right hand to trigger the click command, the cursor unsurprisingly jumped because it is a multi-touch capable pad. And anyway, the possible gestures appear to be difficult to initiate on the touchpad, especially if you have already collected experience with various smartphones based on touch. 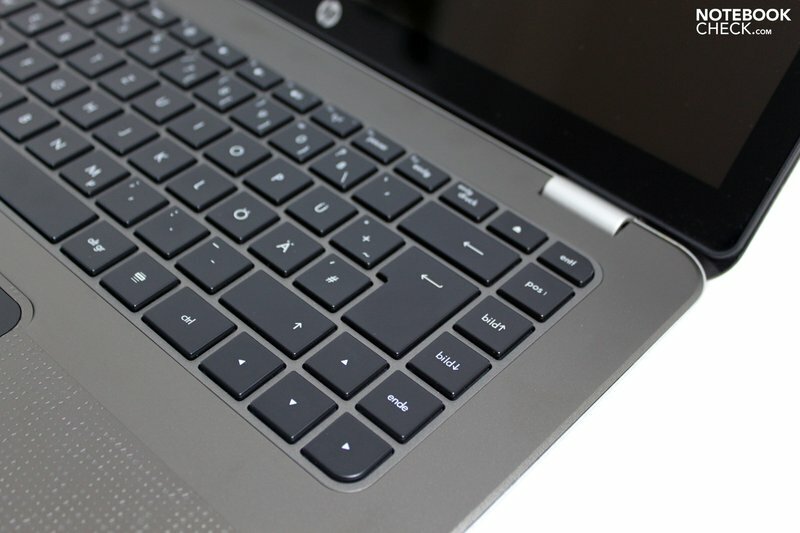 Positive: a double finger tip in the upper touchpad corner deactivates it immediately and prevents impending erroneous inputs during typing on the keyboard. 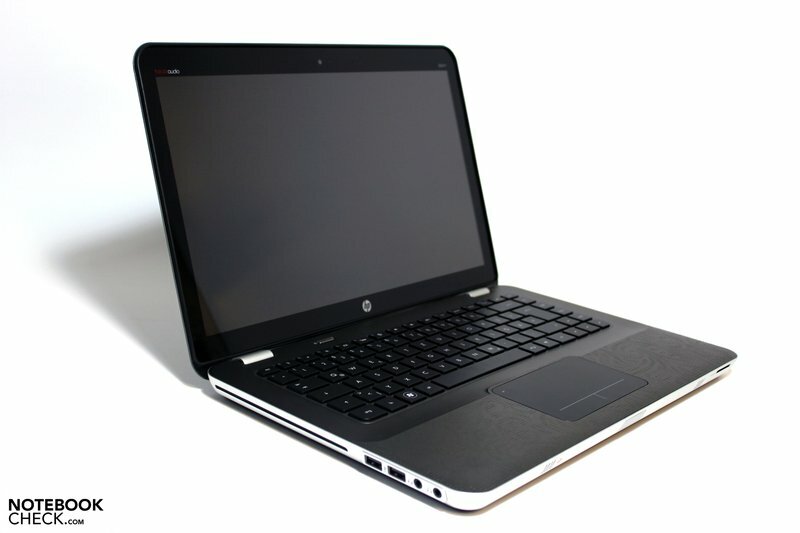 After the display faux pas, Envy 15, HP once again holds all cards for the new models. Which ones are played is a different story. In any case, a good-sounding name for a display type that sets high hopes first has to found. 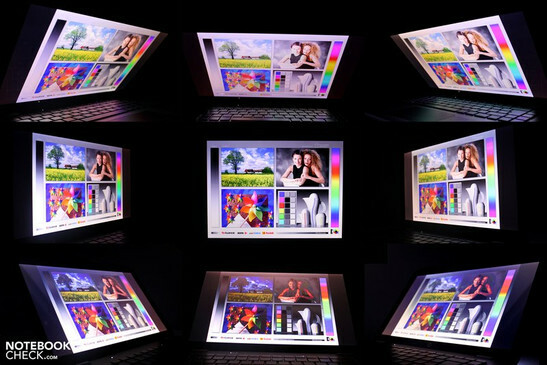 HP instantly christens it: "LED Radiance Infinity Display". In clear language that translates to a reflective 14.5 inch screen with a glossy surface (edge-to-edge) and HD+ resolution, that is 1600x900 pixels. So far, so good. But what do our measuring instruments record? A maximum display brightness of 292 cd/m2 and an average rate of a still very good 253 cd/m2 are a good start. The illumination of about 80% is also alright with the accordingly high measured rates. Observable dimming in brightness distribution weren't recorded. One criterion, which especially one budget notebook after the other fails to achieve is the given image contrast. However, the used screen (LCD0E09) doesn't show any shortcomings here, either. 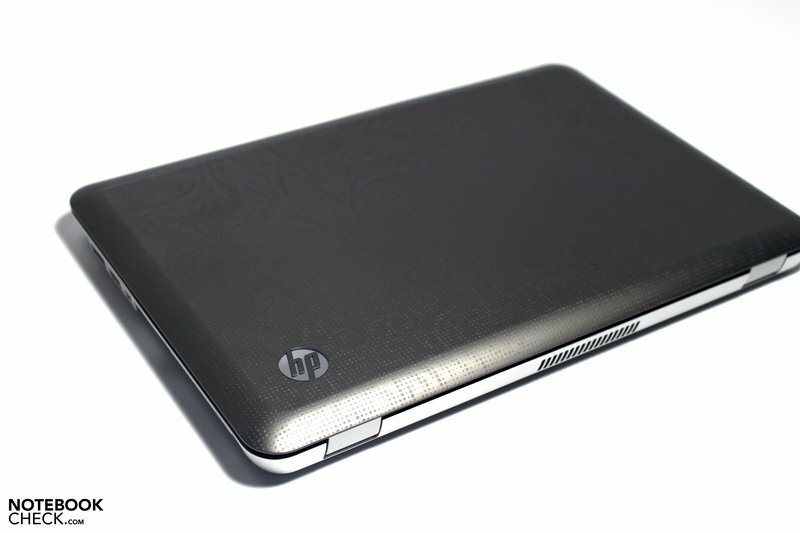 With an exemplary low black value of 0.29 cd/m2, the HP Envy 14 reaches an excellent result of 852:1 in this exercise. 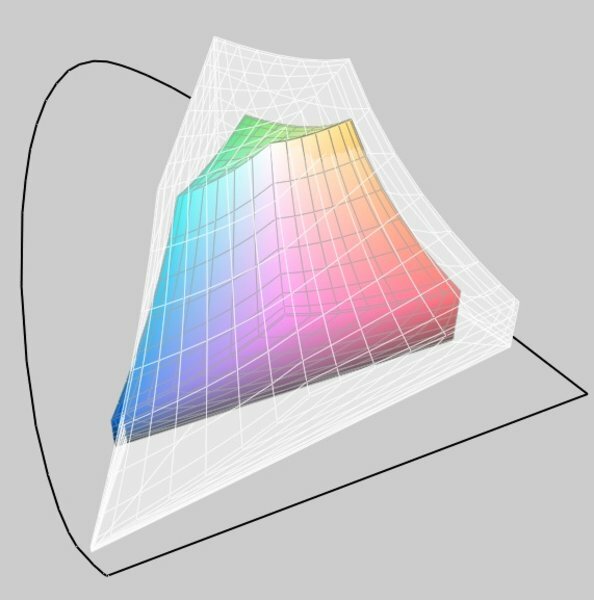 Thus, displayed pictures aren't only subjectively convincing, but also the measurement of the representable color space speaks a similar language. 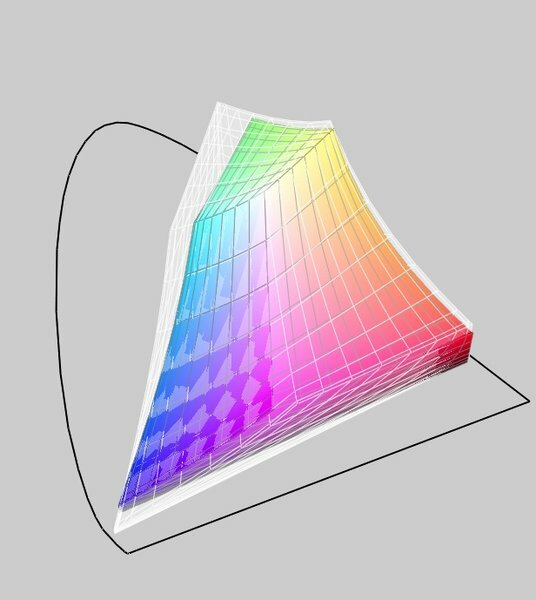 The measurement with the Spyder 3 tool verifies: The built-in wide gamut display can cover both the RGB and the sRGB color space almost completely. Therewith, the display outclasses the usual screens of low-priced multimedia machines and lines up to Apple MacBook Pros with similar display qualities. 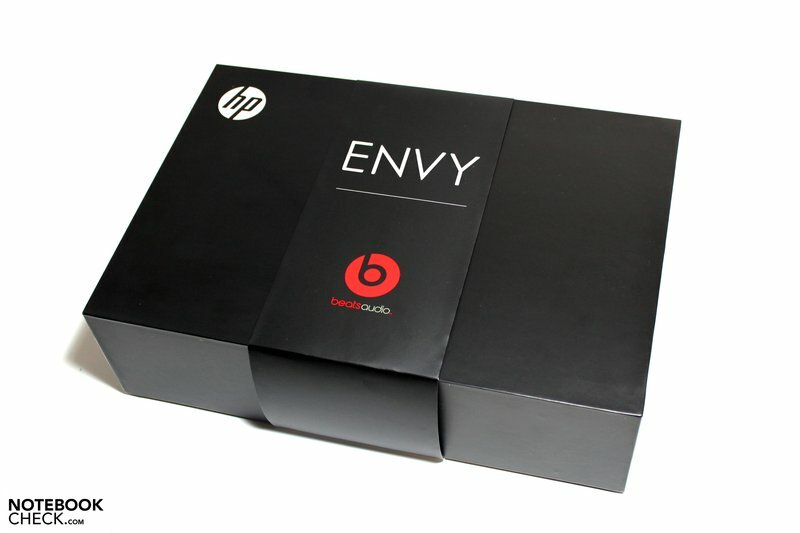 The 14 inch Envy is, so to say, the mobile alternative of the series. In our opinion, this also includes an outdoor use in direct daylight or even sunlight. 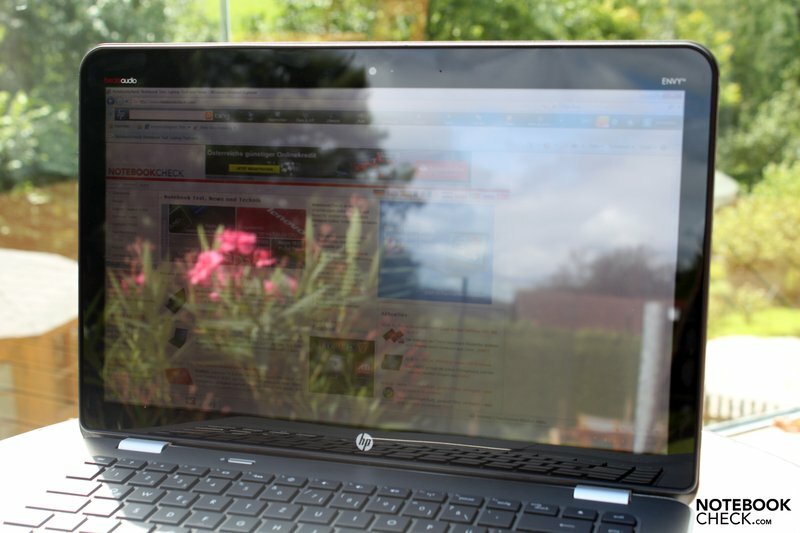 The notebook's good display brightness has a positive impact. Even unfavorable ambient light conditions are outshone. The reflective display surface that provokes reflections in unfavorable viewing angles isn't as suitable. To sum up, it can be said: outdoors, yes - but with restrictions with regard to sun / light incidence. 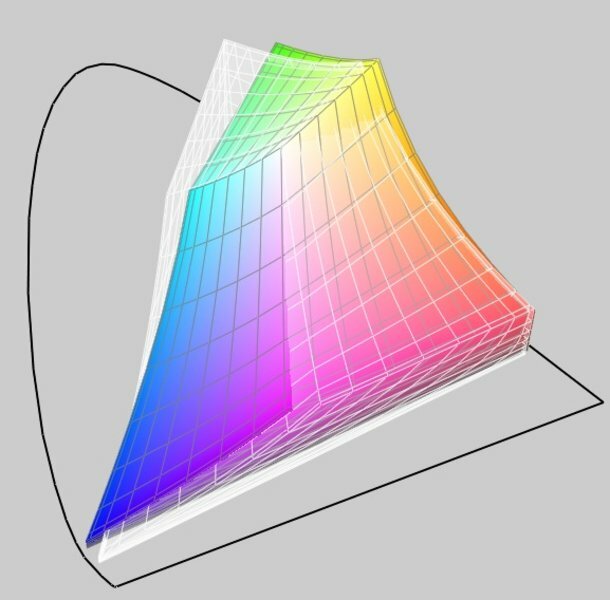 The last assessment criterion for the display is the given viewing angle stability. The Envy 14 also performs to our satisfaction here. The displayed image remains genuine even in narrow viewing angles for a long time on the horizontal viewing plane. You rather have to count with annoying reflections turning up here. Along the vertical viewing plane, the screen shows itself less tolerant. Nevertheless, it still is better than the majority of current notebooks. The Envy 14's accordingly high position also let expectations grow in view of performance. A first look at the notebook's specifications however gives reason for hope. 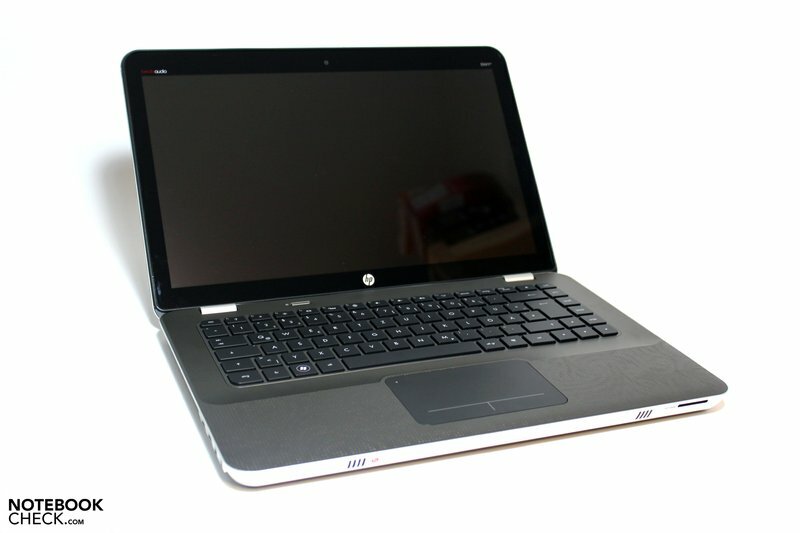 HP uses an Intel CPU as the computing unit. To be more precise, the i5-520M chip, a representative of the latest Arrandale CPU generation. The native dual core clocks with 2.4 GHz but can increase the core rate up to 2.93 GHz due to Intel's Turbo Boost. That happens dynamically and without the user's assistance. It's controlled by the performance requirement of the current application and the system's available cooling performance. Due to hyperthreading, the CPU can also manage up to 4 tasks at the same time. Optimized multi-core applications primarily benefit from it. You can find more information about the built-in processor in our Arrandale feature article or in our CPU comparison. HP doesn't list alternate processors up to now. However, HP has come up with something for graphic issues. Thus, the Envy 14 has a combination of the Intel GMA HD graphics solution integrated in the CPU unit and the dedicated ATI Mobility Radeon HD5650 graphic card with a one gigabyte DDR3 video memory. Whilst the integrated GMA HD graphic chip can score in particular with its high energy savings abilities, the dedicated graphic card from ATI is a very strong chip from the upper midrange. Contrary to Optimus Technology from the competitor, Nvidia, a manual switching between the integrated and the dedicated graphics is necessary in the Envy 14. This may not be as comfortable as Nvidia's solution, but it allows experienced users to keep control of which GPU is active. However, it's annoying that some application have to be closed beforehand. whereupon a small icon pops up. The following benchmarks were all executed with the active ATI graphics. Windows 7's "high performance" profile was enabled. First, we'll take a look at the performance data of the used CPU. The Envy 14 achieves 3680 points in the Cinebench R10 Rendering test (1xCPU, 64-bit) with the i5-520M. The chip is thus in the mid-field of observed rates from 3400-3900 points in previously tested notebooks with an identical CPU. The processor can manage up to four threads at the same time due to hyperthreading in the multi-core rendering test and thus score good 7681 points. This rate also fits in our benchmark database. Finally, the same applies for the Cinebench R11.5 CPU Benchmark test. 2.1 points correlates to the majority of results of comparison devices. The PCMark Vantage benchmark test from Futuremark rates more than only the CPU's sheer computing performance. Here, all built-in components have an impact on the result. And lo and behold, the achieved 6914 points in the overall score are impressive. 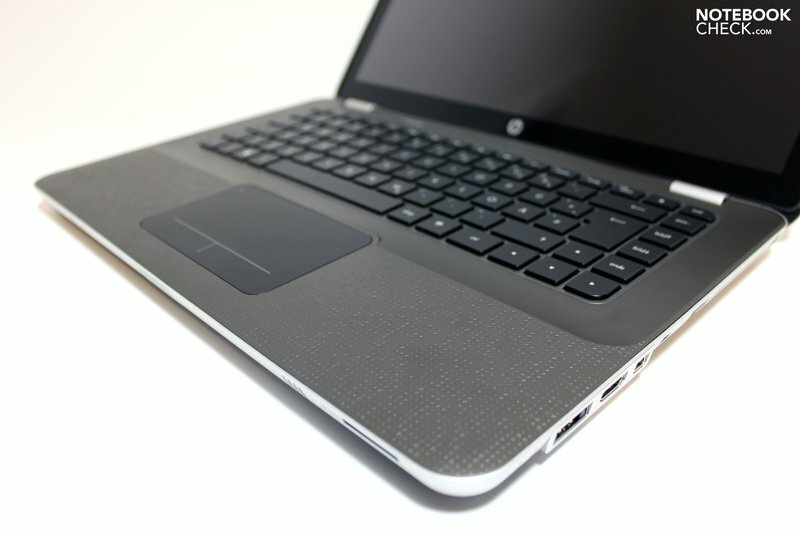 Thus the HP Envy 14 places itself only slightly behind business machines, such as the Elitebook 8540w, also from HP, or even the Thinkpad T410s, equipped with the same CPU and Intel GMA HD Graphics, but with a lightning fast SSD as mass memory. Various multimedia machines, like the Asus N82JV with an i7-620M CPU and GT 335M graphics, or the aligned for graphics, MSI GX640 with an i5-430M and ATI HD5850 graphics, can be caught up with in this assessment. 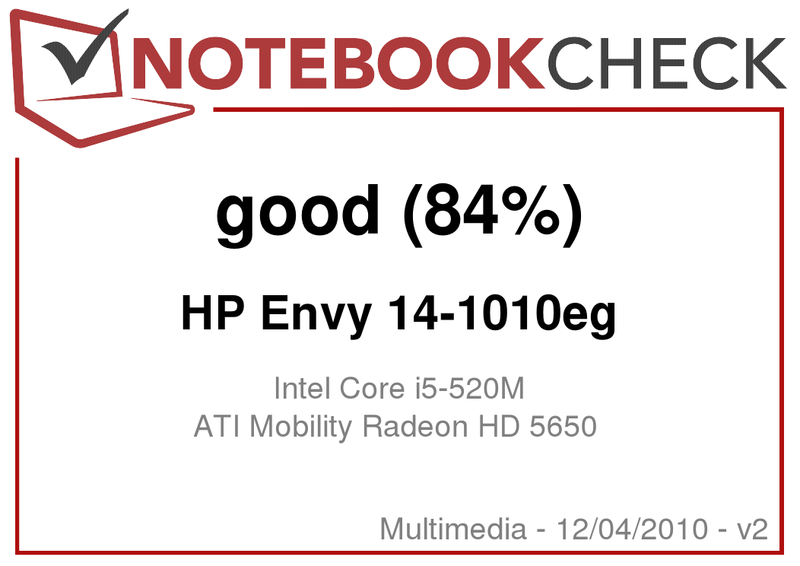 Windows 7's performance index confirms that the Envy 14 at hand has a well-balanced total system. Overall, a high score or 5.9 points can be reached that goes to the "expense" of the built-in memory and hard disk - both issues, which could be improved by a creative tuner. GPU and CPU are each rated with a high 6.7 points. The built-in ATI Mobility Radeon HD5650 isn't a stranger for the gaming oriented audience any longer. The midrange graphic chip could already score with its first rate performance data combined with an attractive system price a short time after its release early this year. In view of performance, the graphic chip positions itself considerably over Nvidia's Geforce GT 335M, on about par with the GTS 350M. Due to a 40 nanometer production, the chip's power consumption is kept within limits (15-19W). Then there is it's compatibility with DirectX11, which Nvidia will first supply in the upcoming offshoots of the GTX 480M. Long story made short. 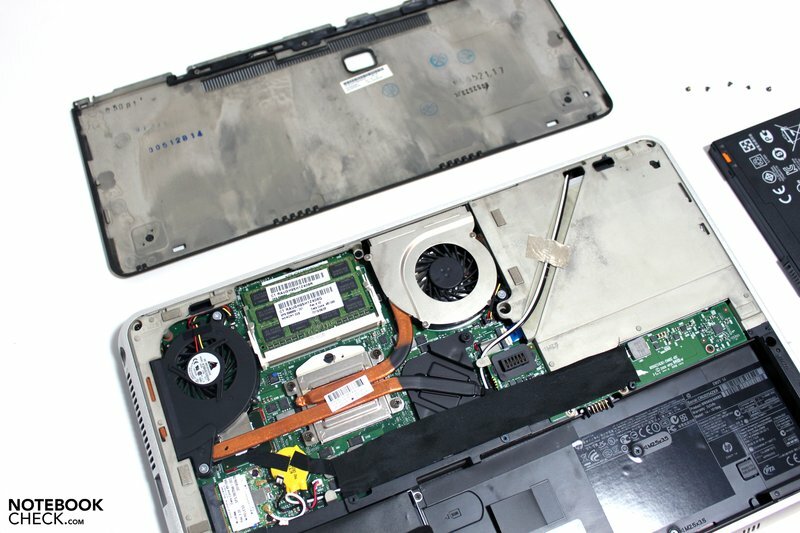 Our test system achieved 6187 points (1280x1024) in the widely used 3DMark 2006, and thus remains a bit behind the rates of comparably equipped notebooks. For example, the Acer Travelmate 5740G, with an i5-520M CPU and the same graphic chip achieves 6715 points, which is a plus of 8.5%. The Envy 14 positions itself again mid-field in the 3DMark Vantage benchmark test. The notebook remains about 12% behind the Deviltech Fire DTX notebook, equipped with an i7-720QM quad-core CPU, and about 10% in front of the Sony EB1S1 with an i5-430M processor with 3079 points. In return, the Envy 14 places itself at the top in Cinebench's OpenGL Shading test. A top result is scored in the R10 version, even above the level of a Thinkpad W701 with Quadro FX 2800M graphics with 5047 points. The R11.5 test shows a similar ranking. 22.2 points secure a place at the top. But the just mentioned W701 clearly has the lead in this exercise with 28.2 points. HP takes a Seagate ST9500420AS for the built-in hard disk. That is a common data carrier, which however belongs to the faster ones of its kind with a rotation speed of 7200 revolutions per minute. There is also enough memory space available for various documents, programs, music and videos with a gross capacity of 500 gigabyte. The rates measured with HDTune correlate to the existing entries in our database. With an average transfer rate of 77.7 MB/s and an access rate of 18.2 milliseconds, the hard disk places itself in the top field of conventional mass memories. A performance boost could be achieved with the use of a solid state drive, which however you have to upgrade on your own and has an impact on the system price with steep prices. Many notebooks have an ATI HD 5650, and our database is accordingly well-filled with gaming comparisons of mobile graphic cards. 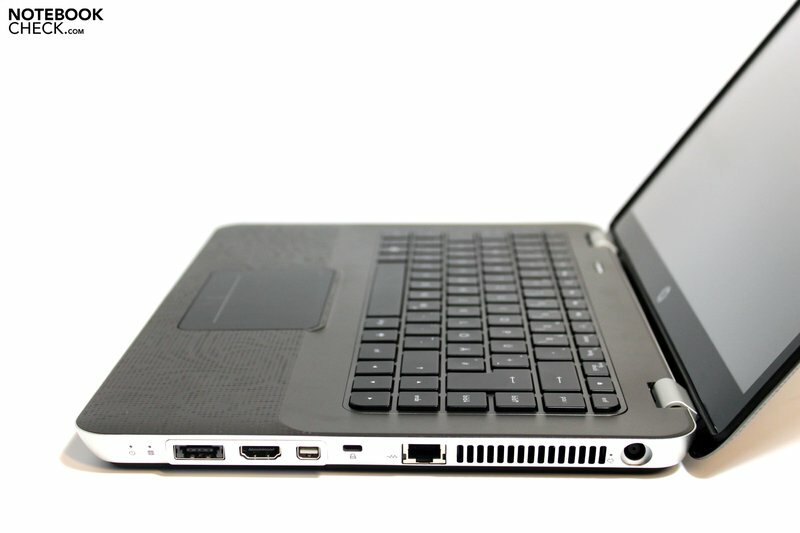 The respective results, apart from slight system fluctuations (CPU), can also be applied to the Envy 14. To confirm this, we used two selected games for a check. The latest NFS series' race game runs on the Envy 14 with a bit of a bad feeling. Just only an average of 36.4 fps can be achieved with medium graphic settings (all on, medium, 2xAA) and a resolution of 1024x768 pixels. If it's set to the maximum native resolution of 1600x900 pixels and high graphic details (high, 4xAA), the HD 5650 caves in with 21.8 fps. A smooth game is now out of question. If the results are compared to records in our database, the Envy 14 places itself well in the center of similarly equipped notebooks. Merely the Deviltech Fire DTX with a quad-core CPU and the same graphic chip can distinguish itself significantly in medium settings with 44 fps. Even the rally classic is quite demanding in terms of graphic requirements. The Envy 14 rewards medium details (1024x768, medium, 0xAA) with an averagely smooth 51.9 fps. Increasing the detail level to high and the native HD+ resolution results in the same effect as in Shift: The frame rate nosedives to an unplayable 21.0 fps. 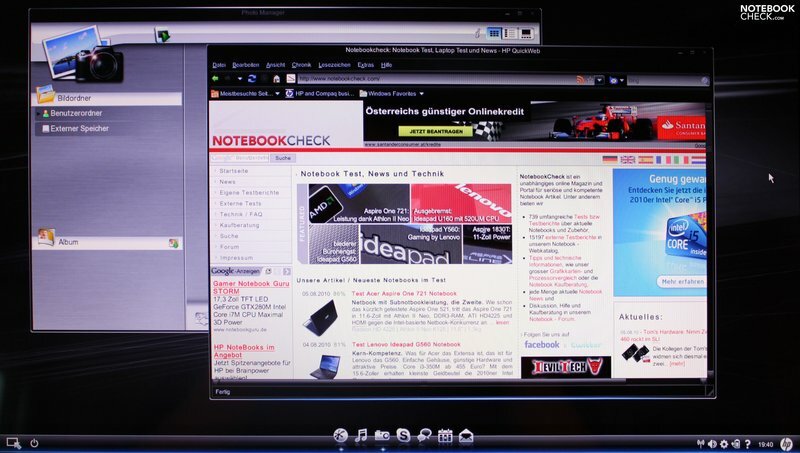 In comparison, the Acer Aspire 7551G, equipped with HD5650 graphics and N930 CPU that however has 4 cores can distance itself here (61.3 fps - medium). The Sony Vaio EB2S1 (430M/HD5650) lags slightly behind in this exercise with 42.3 fps. The ATI Mobility Radeon HD 5650 is very well able to render current games smoothly. However, you'll have to accept restrictions in graphic quality and resolution. Whilst a smooth frame rate is still possible in most games in medium details, it already gets very tight in high settings. The high native resolution of 1600x900 pixels can hardly be exhausted in current games. The GPU's performance is simply not enough. Nevertheless, games like Bad Company 2 or Modern Warfare 2 can very well be played with restrictions. Even the new Starcraft 2 should run without difficulty with reduced details. You can find more information about this in our gaming list of mobile graphic cards. The Envy 14 has a key feature with the GPU hybrid solution when performance and manageable emissions, as well as a reasonable battery life are to be combined in one device. 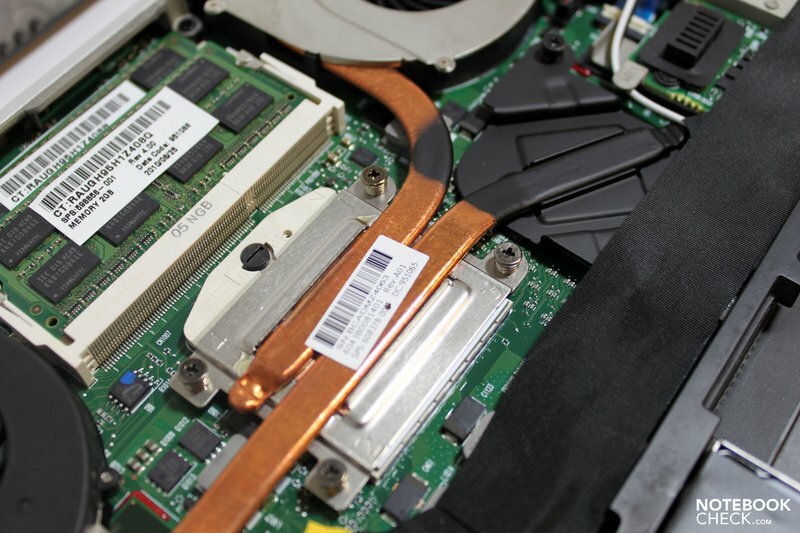 In use with the Intel GMA HD graphics without load, or with low demand office applications, the fan stays in audibly in the background with 33.4 dB(A). The hard disk's rotation noise can be described as almost more present subjectively. Every now and again, an increase up to 35.6 dB(A) can be observed, whereby the notebook is then very audible. Without load, tested with the active ATI graphic solution, 38.4-42.7 d(B)A are possible during gaming. The soundscape design is more or less disturbing, depending on the game. In the stress test, so loading the CPU and GPU over a longer period, the notebook achieves a maximum of 45.2 dB(A) and is unpleasantly loud then. This state will hardly ever be reached in practical use, though. Particularly the somewhat larger predecessor, Envy 15, was known for a slightly warmer work environment. 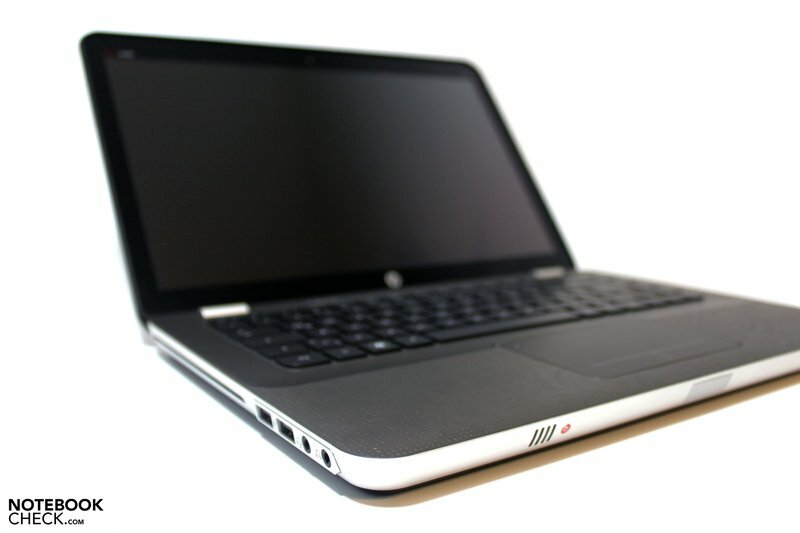 HP has obviously learned its lesson because such tendencies aren't seen in the Envy 14. The temperatures of the base unit's bottom and upper side are always within limits in idle mode and only surpass the 30°C mark slightly. The aluminum case stays reasonably tempered even in the stress test. The upper side reaches its maximum at 40.8°C in the right edge area where the system's fan is found. The bottom stays slightly below these rates with up to 39.3°C. Therefore, a use on the lap is possible without hesitation. A look under the Envy 14's hood present considerably higher temperatures, but they also stay within an unproblematic area. The CPU reaches a maximum of 89°C in the stress test (Prime95/Furmark) and settles to a bit over 80°C in the long run. The GPU stays stable at a similar level of around 80°C. Apart from short clock rate cave-ins in the TMonitor diagram, a possible processor throttling couldn't be observed. A 3DMark benchmark test, executed immediately after the stress test, practically presented identical results as it did in a cold operating state. (±) The maximum temperature on the upper side is 40.8 °C / 105 F, compared to the average of 36.5 °C / 98 F, ranging from 21.1 to 71 °C for the class Multimedia. 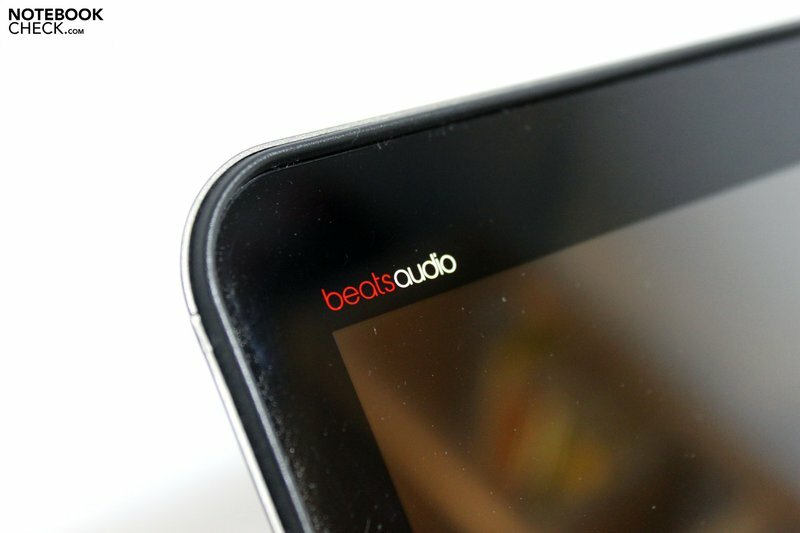 The built-in speakers emit a clear and present sound, but the sound volume leaves a lot to be desired. The lack of midrange and bass in the very treble-prone sound doesn't exactly make the playback of favorite MP3s to a treat. Even external budget speakers can supply a better sound. Under the aforementioned aluminum cover on the case's bottom, a large 8 cell, lithium ion battery with a capacity of 59Wh is found, and which can easily be removed from the case. There aren't yet any alternatives. However, it is possible to expand the integrated battery with an external solution. 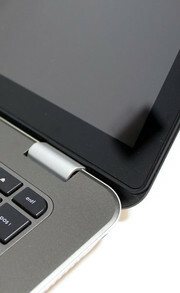 HP has planned the docking of a slice solution via its own interface on the base unit's bottom. This increases the device's construction height by about 10 millimeters. According supplies aren't yet available, though and aren't listed at HP or in various shops, either. 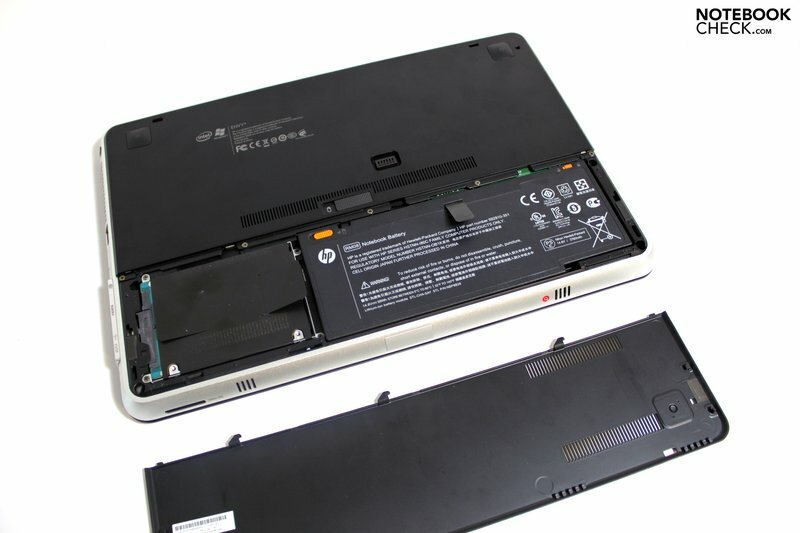 A "6 cell SlimFit Extended Life Battery - oversized" can be read solely on HP's US American website, and is supposed to make runtimes of up to 7.5 hours possible. Prices for this extension are also still unknown. 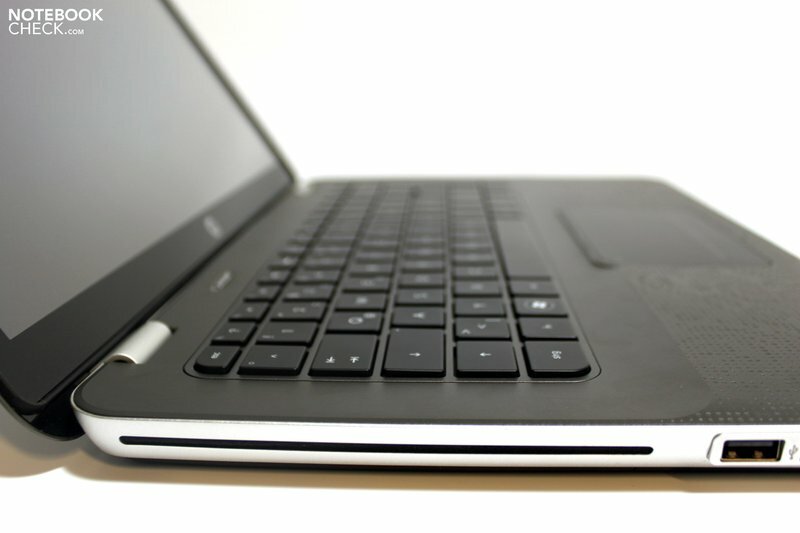 The slice solution for the Envy 13 has a price tag of about 160 US dollars, though. This could really be an interesting solution especially for models that are used mobile. But now to the battery life of the model at hand. The Envy 14 reaches an acceptable result of 263 minutes, so a bit more than four hours, in the test of the maximum battery life, with BatteryEater Reader's test. All communication modules were disabled, the display ran with minimum brightness and the system was in the energy savings mode with integrated GMA HD Graphics for this. When all is set for performance, that is active HD5650 graphics, high performance profile, max. display brightness, enabled wireless modules and the computer is also put under load (BatteryEater Classic test), it already comes to an end after 60 minutes. Practical use with internet surfing, active GMA HD Graphics and customized display brightness agreeably still provides almost four hours of battery life. We visited the most various websites, read texts and watched short videos in this time. The integrated graphic solution makes a good impression here. Even rendering a DVD isn't a big problem for the Envy 14. Long Hollywood blockbusters are possible in around 3.5 hours. 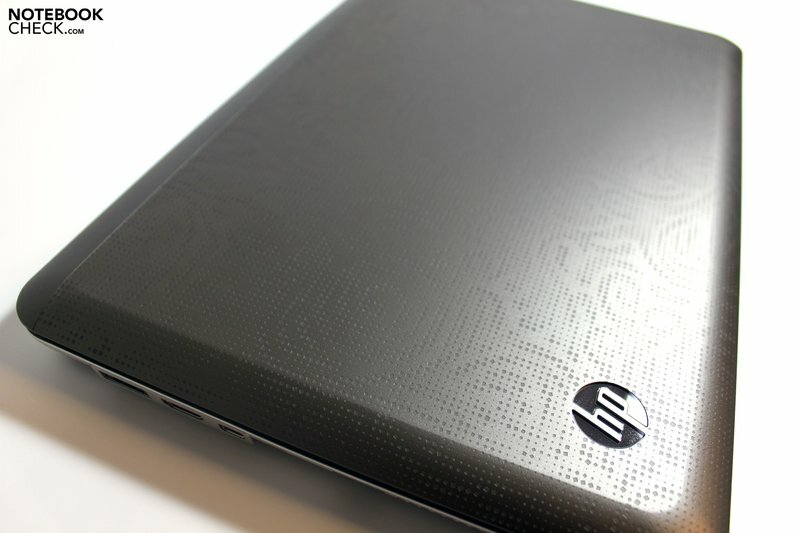 A look at the notebook's power consumption affirms the hybrid graphic solution's sensibility. 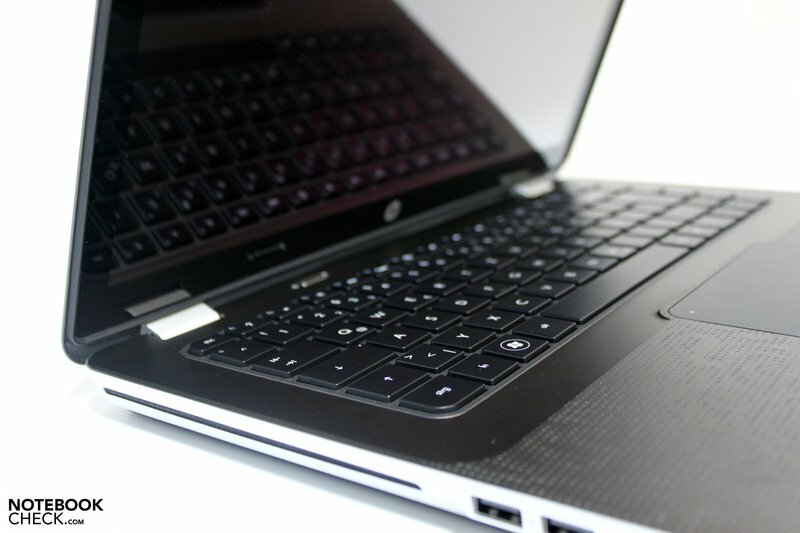 The notebook treats itself to a minimum of 11.4W with active GMA HD Graphics. It is even 14.5W with the HD5650, so almost around 30% more. The power consumption looks similar in office mode. The GMA HD shows an impressive savings potential under load, but then again it's usually more a matter of performance than runtime here. You don't have to worry about your electricity bill even when the device's power is off with 0.2W in a deactivated state and 0.3W in standby. The ingredients are balanced and HP has even done almost everything right with the seasoning. The stylish case still bids a top-notch stability and an attractive jacket for a high-quality configuration. As to the connections, you generally locate the right interfaces without fail, whereas we weren't always happy with their placement. This especially applies to the image and video outputs on the case's right. We liked the integrated keyboard, which comes very close to the current MacBook Pros from Apple, but just with a Windows layout. This looks different for the touchpad. The generous size and the pleasant surfaces are impressive, but not the keys' solution and the possible multi-touch gestures. The silver Californians undeniably still have the lead here. The used display surprised us pleasantly. It doesn't only have an excellent brightness of up to almost 300 cd/m2, but the high image contrast and the excellent representable color space are persuading arguments. However, you have to live with the glare surface. 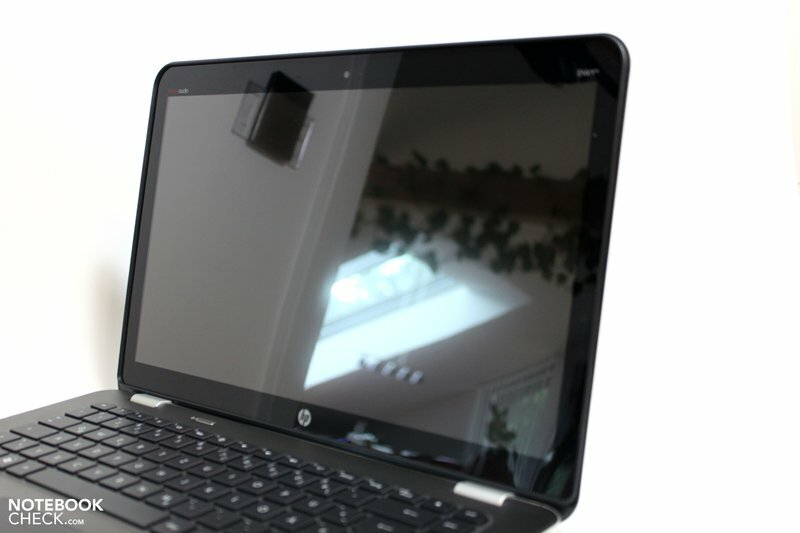 Note: According to current information HP does no longer equip the Envy 14 with a Radiance display. Instead, a standard screen without enhanced color space is used. As to the HP Envy 14's performance, the right choice has equally been made with a combination of Intel's i5-520M CPU and the hybrid graphic solution. The good results of the benchmark tests verify the system an excellent application performance and also an acceptable 3D performance with the HD5650. 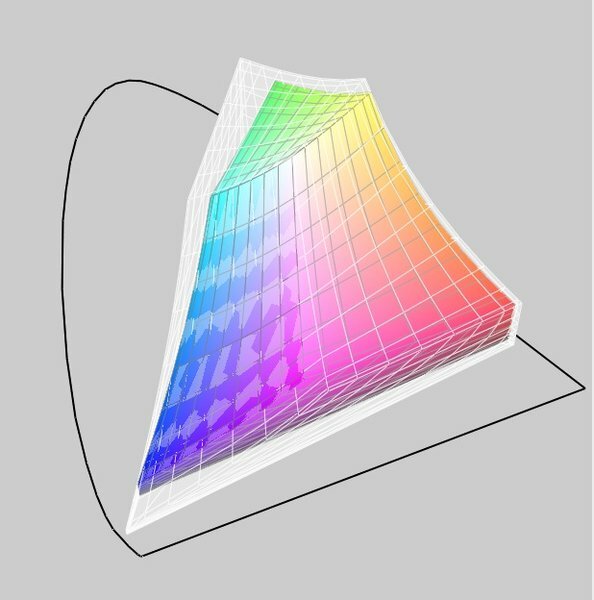 In the end, the hybrid graphic solution can score in the notebook's heat emission and system noise. However, the dominating 7200 rpm hard disk attracts attention unpleasantly especially in use without load. The surface temperatures stay consistently within a green field, even under load and active ATI graphics. Finally, a positive conclusion can also be drawn in view of the given battery life. With up to four hours in practical use, the compact multimedia notebook can be used freely on the go. Consequently, the question turns up: What's the above bundle worth? A MBP13 can be bought for a bit over 1000 euro, the rather more in terms of performance comparable MBP15 starts at about 1600 euro. It doesn't look much different for the T410s. You can join in for starting at 1800 euro, but with SSD and without a comparable graphic solution. However, if you are looking for a comparably equipped notebook, you'll quickly drop under the 1000 euro mark, whereas case stability and display aren't at all comparable anymore. So, it almost looks as though you'll simply have to dig deeper into your pocket for an elegant, quality device with strong components. There's actually hardly any immediate competition at the moment. This likely also explains HP's suggested price: you're in the game for starting at 1299 euro. That high-end notebooks are still found on the market despite the hype for discount notebooks. Way to go. 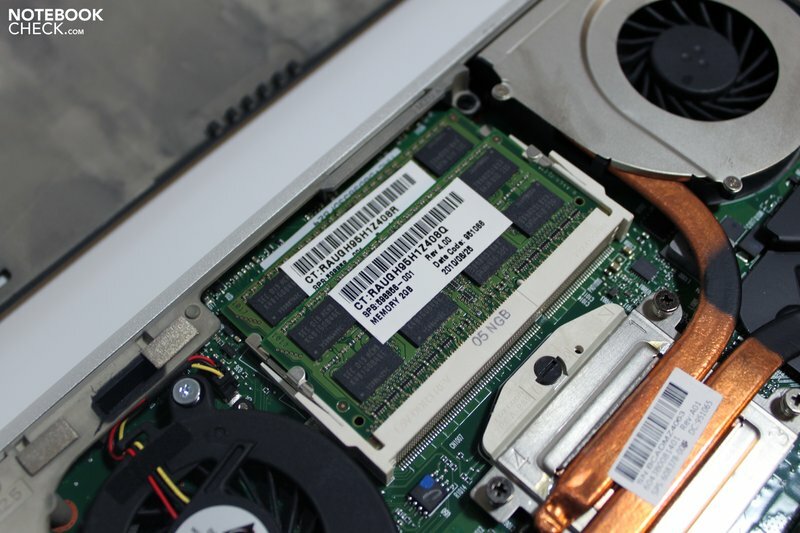 A SSD ex-factory would have given the Envy's high standard the final touch. It was already feared that good displays are gone for good. Fortunately, that's not true. 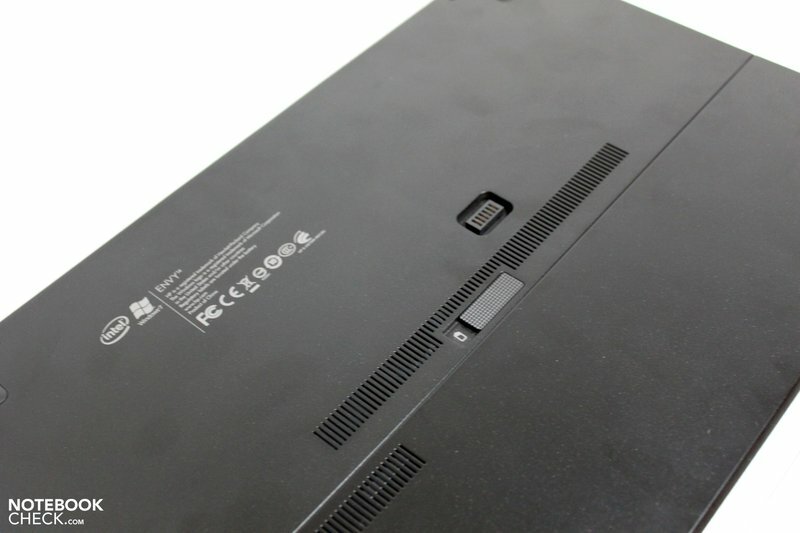 In the Windows field, most likely found in business notebooks: Lenovo Thinkpad T410s, and Dell Latitude E6410, but without style factor. 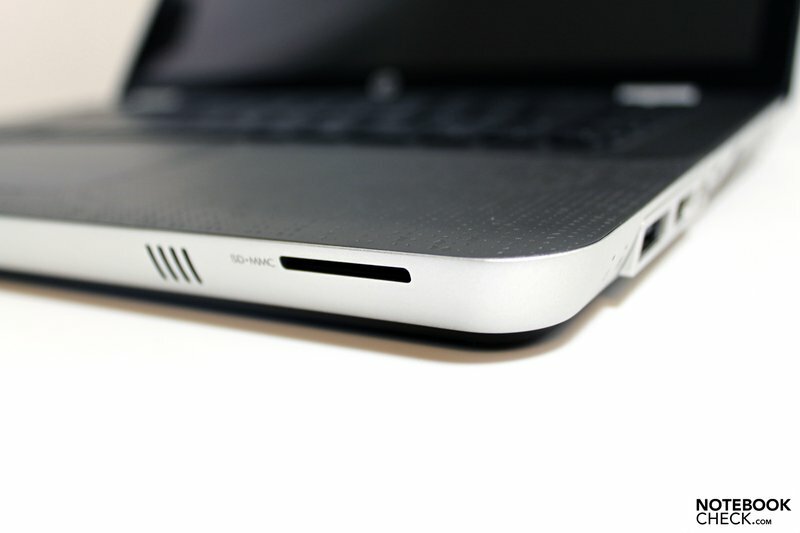 If design is an issue: Apple MacBook Pro 13.